Spring has sprung, and a bumper crop of prototypes are emerging on the highways and byways of the metro Detroit area. The most recent species to cross the path of our cagey photogs is what we believe to be the Ram Rebel TRX, accompanied by the distinctive whine of a supercharged V-8. The Ram Rebel TRX concept first met the public at the 2016 State Fair of Texas, surprising all in attendance. Ford had been stealing hearts and headlines with its F-150 Raptor production off-roader for a few years, and while most inside the industry figured Ram must be working on something, the Ram Rebel TRX concept made it from the design studio to the stage with uncharacteristic secrecy. Its status as a future production model was hinted at during FCA's 2018 five-year presentation plan in mid-2018, and reviewing the plan in detail filled in enough holes for us to consider the TRX a done deal. 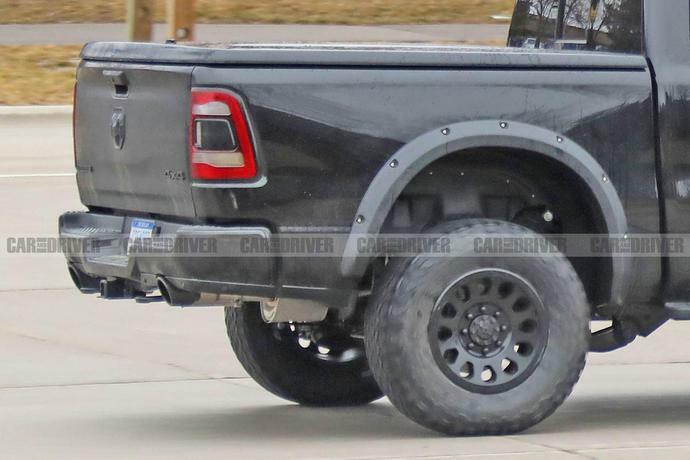 Now we've got these spy photos, which display (somewhat subtly, we might add) a few of the key elements needed to prep a current Ram 1500 pickup-to be clear, not the previous model that is still for sale as the Ram 1500 Classic-for brutal off-road duty. The first clues are obvious: the increased ride height, the aftermarket or new production design wheels, and the rugged fender flares' exposed fasteners. At this point, you might be thinking, "So what? The rear bumper is straight-up Rebel, and those are probably just new fender flares." Although you wouldn't be wrong, closer inspection reveals a seriously beefy rear control arm and mount, constructed out of the no-nonsense type of square-wall tubing used in military vehicles, and an internal bypass/reservoir damper of a type not seen on the Rebel before. As for the powertrain, our photographer, no stranger to the pursuit of development mules, remarked, "Boy, is it fast." He also made out the sound of a supercharged V-8, likening it to the telltale siren song of the Hellcat V-8. While only Ram knows what resides under the power bulge of this mule's hood, we're betting the company will abandon the 575-hp tune of the TRX concept's supercharged 6.2-liter V-8 and go for the gusto with the 707 horsepower of the full-on Hellcat engine when the Ram Rebel TRX pickup makes its debut in 2020.